Looking for best SSB interview coaching academies in India to crack SSB? 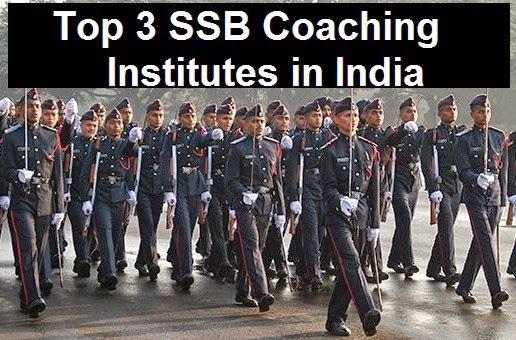 Here are the recommended best three SSB coaching centers by experts. So check out top three SSB coaching providers in India. There are number of coaching institutes and training centers which do provide coaching for SSB interviews in India. Choosing the best institute will guarantee the final selection in SSBs. In order to become commissioned officer in Indian Armed Forces such as Air Force, Army and Navy, one must crack Services Selection Board (SSB) or Air Force Selection Board. These boards conduct SSB interviews for five days to ascertain whether a candidate do have required Officers Like Qualities (OLQs) in him or not. In order to become an officer one must have all OLQs in him for giving best performance under any stressful situation during his service. First time appearing candidates in SSB interviews without any proper guidance may land up in trouble as SSB schedule is very hectic one and needs lots of continuous attention. So it is better to have SSB interview coaching. Having attended the SSB interview coaching is not sufficient to crack SSBs. Main factor is to get coaching in best SSB interview academy. We have provided top three best SSB interview coaching institutes here. According to our experts, Baalnoi Academy, New Delhi is the best SSB interview coaching academy in India. Baalnoi Academy was started by Ex-NDA officer Major(Retd.) HS Khalsi who worked in various SSB selection boards as psychologist during his service in Indian Army. Major Khalsi is the key person making the Baalnoi Academy the best institute for SSB coaching in India as he motivates the candidates like no other can do. Baalnoi Academy has two branches one in New Delhi and another one in Jaipur. Between these two branches, we recommend only Baalnoi Academy New Delhi as the best SSB interview coaching center. In New Delhi, Baalnoi Academy is located in Janak Puri near to Tilak Nagar metro station. Good exposure of all GTO and psychology tests by ex SSB officers. Special attention is given for repeaters. Special personal interviews conducted in a similar fashion of SSB interviews. Plenty of practice for group discussions. Word Association test (WAT) practice is given. Thus all above factors do make Baalnoi academy as one of the best SSB interview coaching academies in India. Second best SSB coaching academy in India according to our experts is the famous Cavalier Bangalore. Cavalier has many branches in India and day by day this group is opening new coaching academies in almost all cities in India. Out of these all branches of Cavalier coaching academy, we recommend Bangalore branch as the top institute for taking SSB interview coaching. Cavalier Bangalore is located in Banasawadi. Thorough practice of Pilot Aptitude Battery Test. Good exposure for PPDT and TAT tests of SSB interviews. Grooming of candidates to make them leaders. Repeaters get extra practice time and attention. Emphasis on personality test or personal interviews. Thus, Cavalier Bangalore is the second best SSB interview academy in India. Third on our top three SSB coaching institutes in India is Minerva Academy. Minerva Academy was founded by Retd. Lt. Col. Deol in Chandigarh. This is also one of the oldest SSB training centers in India. Since its establishment in 1955, this coaching academy has turned many aspirants into true leaders and gave successful career in Indian Armed Forces as officers. 10 acres of campus for conducting GTO tasks. Best faculty for GTO tests. Good in providing SSB interview techniques. Best practice for current affairs and group discussion topics. Provides tips for passing screening tests of SSB interviews. Good practice on self description. Hence, our experts consider Minerva Academy Chandigarh as one of the best SSB interview coaching centers in India. So here were the three best coaching centers to crack SSB interview.